In LINQ, you normally do paging through the Skip and Take operators. These are the LINQ counterparts to whatever the relational database uses for pagination – ROW_NUMBER(), LIMIT…OFFSET, TOP, ROWNUM, etc. Skip and Take yield different results if added to different places in the LINQ expression. FROM ( SELECT [Extent1]. [Id] AS [Id], [Extent1]. [Name] AS [Name], [Extent1]. Basically, the TOP(5) expression is placed in the wrong place. So, in LINQ, it’s not just the presence of a Skip and Take operator, it’s where you place it that matters! The result is, even if you have a record whose Name column is NULL, it won’t be returned: remember that in SQL, by default, NULL <> NULL! Therefore, if you are not 100% sure that the parameter that you will be using in the LINQ query will never be null, do not mess with UseDatabaseNullSemantics even if it generates somewhat poorer SQL. Of course, if you are using SQL Server, you can set ANSI_NULLS to OFF, and the problem goes away; in that case, NULL = NULL. If you want to create or apply a migration over a DbContext-derived context and your context doesn’t have a public parameterless constructor, it will fail. This happens with both .NET Framework and .NET Core: the problem is that the migrations framework has no way of knowing how to create the context so as to get information from it, the migrations framework actually instantiates it! Create a class that implements IDbContextFactory<T>, where the generic parameter is your DbContext-derived class. Having a parameterless constructor is not always ideal, because you may need to pass something in, like a connection string, but you can do it just for executing migrations and them remove it again. Just make sure that the connection string in use is the right one. Basically, you have to implement the Create method so as to return an instance of your context, doesn’t really matter how you instantiate it. The migrations API will find this class automatically. If you don’t do any of this, you may get weird errors, like, “unable to find the DbContext”, which doesn’t really help much. Another problem you may face is if you have multiple DbContexts, in that case, you have to tell migrations which one to use. After an entity is loaded by Entity Framework, it gets stored in its first level cache. After that, whenever EF executes a query that returns this entity, identified by its primary key, EF always returns the cached entry, and makes no attempt to see if the cached data (the rest of the properties) is still up to date with that returned from the query. This feature is common to other ORMs, but it may result in unexpected behavior – we cannot rely on the state of a loaded entity if the database can change by other processes.. In EF Core, there is no Reload method – although I did write an implementation for it –, so the only option is to detach the entity from the context. 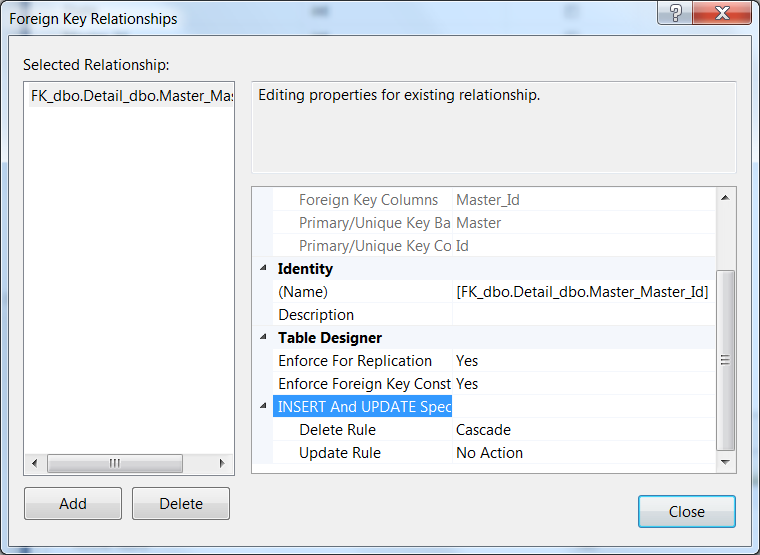 Entity Framework 6.x will traverse the entity graph of all the related entities and set all their states to Added too. This might be a problem. Imagine we want to attach a disconnected (new) entity that is linked to an existing one, for which we already have a reference. In this case, we don’t want this reference to be added, because doing so will raise a violation on the database and it will come out as an exception. What we need to do is to explicitly set the state of any of these existing instances to Unchanged. Fortunately, Entity Framework Core will solve this with the introduction of a new TrackGraph API. Thanks for Tony Sneed (@tonysneed) for reminding me. Meaning, when we remove an entity, it will automatically descend to its dependent entities (cascade) and delete them too. Of course, cascading deletes of many to one really does not make much sense. The problem with cascade deletes configuration in EF is, sometimes it cannot be done with attributes, which is a mapping mechanism that most people like and use, and the different associations need different approaches. Deleting a Master will also delete the Detail, but, of course, not the other way around. If you are curious, EF does this through an ON DELETE CASCADE INDEX, so it is done by the database, not by EF – more on this later. This way, when we delete the Master entity, it will first delete all of its related Detail entities. This is also achieved through the automatically created ON DELETE CASCADE INDEX. This one is the best: guess what, we don’t have to do anything, it just works out of the box! Because Entity Framework relies on INDEXes to cascade the deletes, you cannot just change the code mappings after you created the model – either by adding attributes or through fluent configuration – and expect things to work. If you do, you will likely need to update the database. Do so by creating and applying a new migration. One thing that is still (as of EF 6.x) not supported is deleting orphans, but I already talked about it. EF Core will handle it properly. 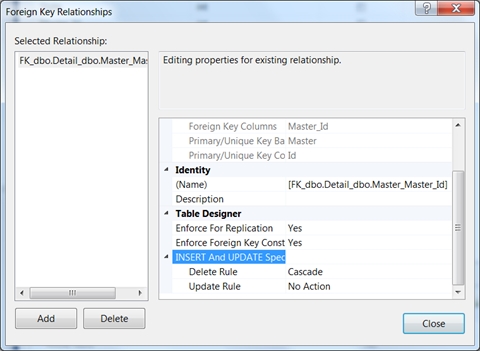 Most people using Entity Framework use the TransactionScope API to manage database transactions. This is a powerful API, that can be used to enlist .NET APIs and even WS-*-compatible web services in transactions, that may well be distributed. Microsoft used to recommend it for working with EF, but isn’t doing it anymore, or, at least, developers need to understand a thing or two. TransactionScopeAsyncFlowOption flag, which can be used to tell TransactionScope to flow transactions across async threads. Also, if we open two database connections inside a TransactionScope, the transaction gets automatically promoted to a distributed one. The problem is, distributed transactions require Microsoft Distributed Transaction Coordinator service running, and it is not available in Azure, for example (Web Apps). So, the key here is: if we cannot be certain of the environment where EF will run, which may include pre-.NET 4.5.1 or Azure, we should use explicit transactions instead. It’s not that difficult, it’s just a matter of calling Database.BeginTransaction() and either committing or rolling back/disposing of the returned object when we are done with it. The static SetConfiguration method of the DbConfiguration class can also be used to set the global configuration programmatically. It has a public parameterless constructor. So, a DbConfiguration in the same assembly as the DbContext is automatically loaded. If there is more than one, the DbContext constructor will throw an exception.